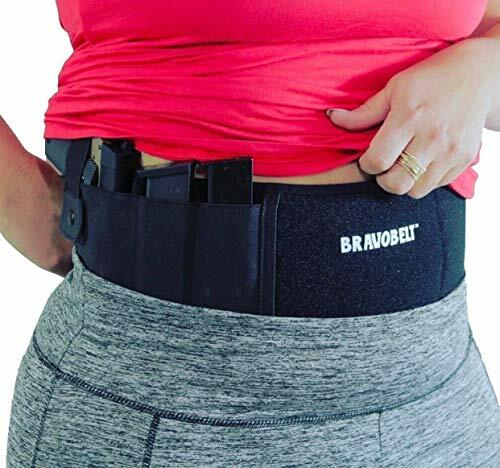 The best belly band holster will keep your handgun safe and concealed under your shirt to help you deal with dangerous situations. These models are soft and comfortable to wear directly against the skin, and they come in different sizes that will fit most shooters. The holsters we review in this article are versatile and they will fit most pistol models. However, certain pistol models can be too large to fit comfortably in concealed carry holsters. If this is the case, we recommend choosing a shoulder holster instead. In the following article, we take a look at the most comfortable belly band holsters available on the market and we reveal their pros and cons. 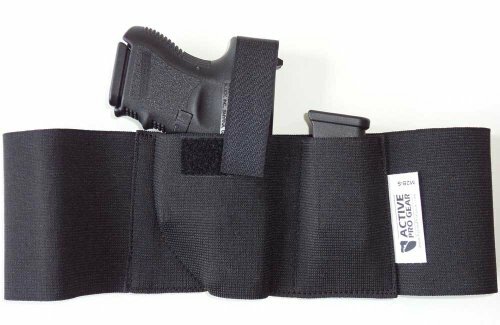 The ComforTac belly band is a one size fits all holster. 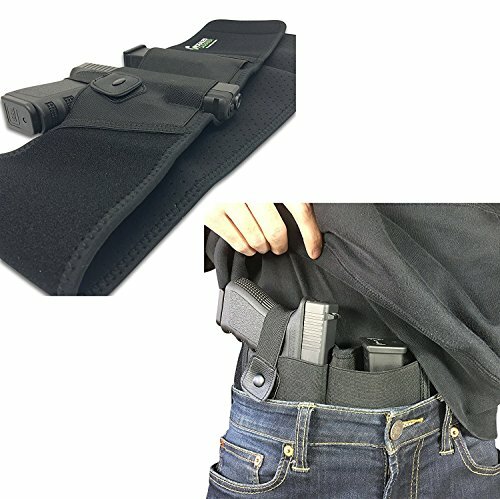 This holster is made out of neoprene and it will fit anyone who has a belly that measures up to 44”. The neoprene is tightly-woven, which makes it soft and comfortable enough to wear directly against the skin without scratching you. One of the things we liked about this model is that it’s versatile. 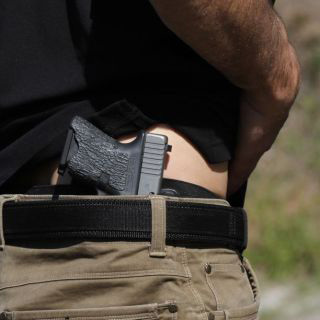 You can wear the belly band inside your waistband or outside your pants, and you can place the holster so you can cross draw, place it behind your hip, in the twelve o’clock position, or on the small of your back. This belly band is available in the left or right-hand draw. Useless Mag Pouch – The mag pouch is useless, and the mags will slip and fall from it when you move. 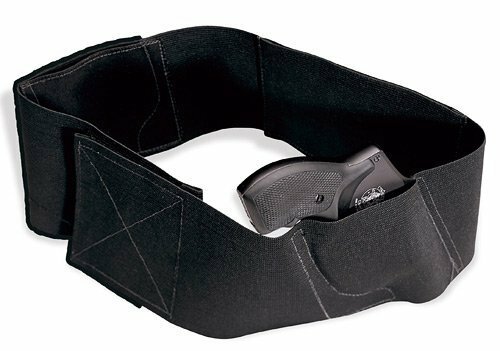 The BravoBelt band holster will fit all sizes up to a 44” waist. This model has a comfortable design that molds to your body so you can conceal carry your handgun all day without it interfering with your movements. We were impressed by the holster’s snug design. Once you set up the band on your waist, it will keep your handgun close to your body, making it very easy to conceal. And this band is also comfortable to wear. Another good thing about this model is that it also offers extra storage room beside holding your handgun. You can easily store extra magazines, keys, money, or even a cellphone while using this model. The For Way belly band holster has an interesting design and comes at a great price. 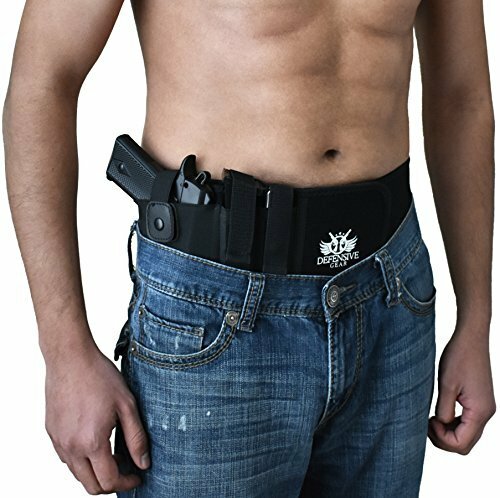 This holster is specially designed to fit inside your waistband, but you can also carry it over your pants or your belly if you want to. When you wear it inside the waistband, the holster sits low on your hips for a more comfortable carry. One of the things we liked about this model is that it’s designed to work with both a left and a right-handed shooter. The holster pocket is spacious enough to fit most pistols, including semis and even revolvers. Breathable Material – This belly band is made out of a breathable material which will allow you to wear it for a very long time without discomfort. The Active Pro Gear is a comfortable belly band holster that comes in multiple sizes that can accommodate most people. The holster has a design that’s spacious enough to fit most pistols, from large framed semis and revolvers to compact and subcompact ones. We really liked this holster’s weight distribution. 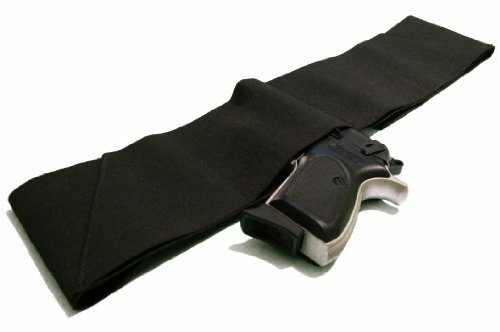 The belly band distributes the weight of the gun on its whole length, making it comfortable to carry your gun for long periods of time. The band is made out of a breathable elastic fabric that will feel soft against your skin. The Velcro endings are durable and strong, and they will support a lot of weight without any problem. The Defensive Gear holster is a one size fits all concealed carry solution that comes at an accessible price. This model is made out of a stretchable neoprene material that’s soft enough to feel comfortable against your skin. The belly band will fit anyone that has a belly of up to 47”. We really liked this holster’s construction. 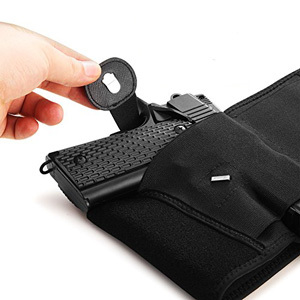 The holster is lightweight and it’s made out of a durable neoprene that will withstand moisture and sun exposure, allowing you to carry it in the open if you want to. This holster comes with snap buttons that keep your gun and ammunition secure. The magazine pouches come with retention straps that will keep the mags from sliding out as you move. Gets Warm – Even though the belly holster should be able to withstand sun exposure, it will get warm and uncomfortable in the summer. Features : Ventilated and durable Suitable for extended use. The Concealed Carrier elastic gun holster is one of the most popular belly holster models currently available, and it comes at a good price. This model comes in two versions, one for each hand orientation. The belly band is made out of high-quality neoprene that can fit any waist up[ to 44”. One of the things we liked about this model is that it has a really snug design. This design will allow you to conceal the holster and your handgun with minimal efforts, and you will be able to hide the gun under shirts, T-shirts, and even sports outfits. Safe – This model comes with a retention strap that will keep your handgun safe and secure at all times. Drawing Needs Practice – You will need to practice your draw if you want to use this holster with good results. 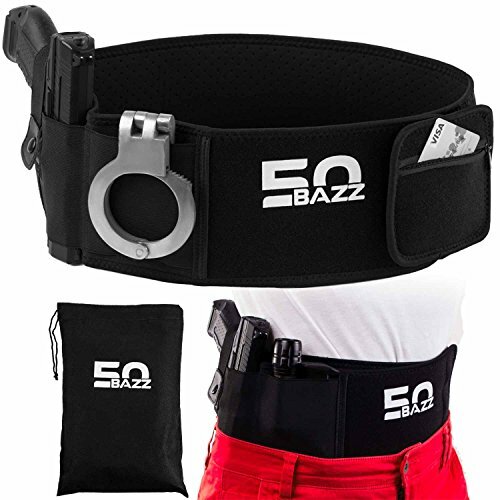 The FiftyBazz belly holster is a great concealed carry option that comes at an affordable price. This model has a versatile design that will fit most handguns, from revolvers to compact, subcompact, and even full-sized pistols. One of the things we liked about this model is that it offers a good storage space. The holster will accommodate a spare magazine, but you can also store a pepper spray or a flashlight in it if you want to. The storage pouch is detachable, so you can take it off if you don’t intend to use it, so the band will be easier to conceal. Strap Could Be Longer – This holster comes with a thumb-break clasp that will keep your gun secure. However, the strap is too short to accommodate some handguns. The UnderTech UnderCover belly band is a comfortable and versatile concealed carry solution. 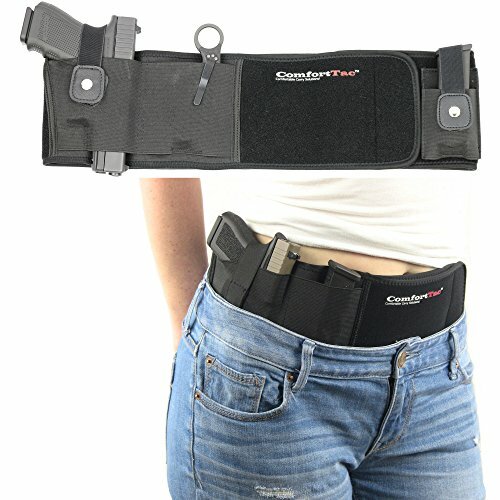 This holster comes in different sizes, so it will accommodate most shooters, no matter how small or large their belly is. A great thing about this model is that it can fit most handguns and it comes with two pistol slots. One of the slots is specially designed to fit revolvers, while the other is designed for automatic pistols. The holster has an ambidextrous design. You can draw your gun with either hand, and you can conceal the holster easily under a shirt or T-shirt thanks to its snug design. Multiple Sizes – This holster comes in various sizes, and that makes it suitable for both petite and large physiques. The Fullmosa waistband holster is a great concealed carry option for those who like to have their handgun and some accessories close at hand at all times. This holster comes in multiple sizes that will accommodate most shooters, and it will fit most handgun models. This is a good holster for the Glock 19. The waistband comes with three pistol holsters. One of the holsters is positioned on the left, one on the right, and the third one on the back, so you can use the one that matches your carry preference. Beside the handgun, this model can fit up to 4 magazines. 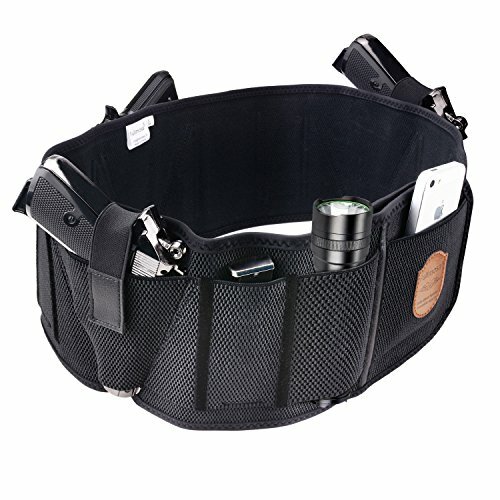 There are two mag pouches on each of its sides, and the band also comes with a small pocket for money and four accessories pockets that can fit flashlights or pepper sprays. Material Is Not Breathable – The belly band is made out of a non-breathable material that can get uncomfortable during the warm season. The Lirisy belly band holster is a good model that has a one size fits all design. This band will fit all shooters have bellies of up to 45” in circumference. The band is made out of an elastic neoprene that allows your skin to breathe and it’s soft enough to wear directly against your skin. One of the things we liked about this model is that it comes with a fixed and a removable pouch. This will give you the opportunity to store an extra ammo mag in the holster, but you can also use the pouches to store a small flashlight, some money, or other valuables. Sizes Run Small – The band’s sizes run small, so you should measure your belly and compare it to the manufacturer’s sizes before ordering. High-quality neoprene Ventilated and durable Suitable for extended use. As you could see, best belly band holster models can accommodate your handgun and some helpful accessories besides. This makes them more versatile than other concealed carry methods without making them obvious to other people. However, you should check your concealed carry state laws to make sure the model you decide on respects legal boundaries. 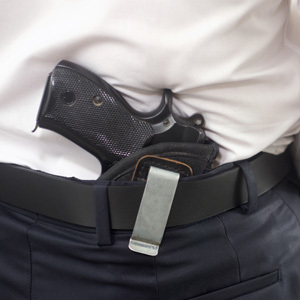 Once you’re sure it does, all that remains is to check if your personal carry option fits in the holster and if the holster fits around your waist.